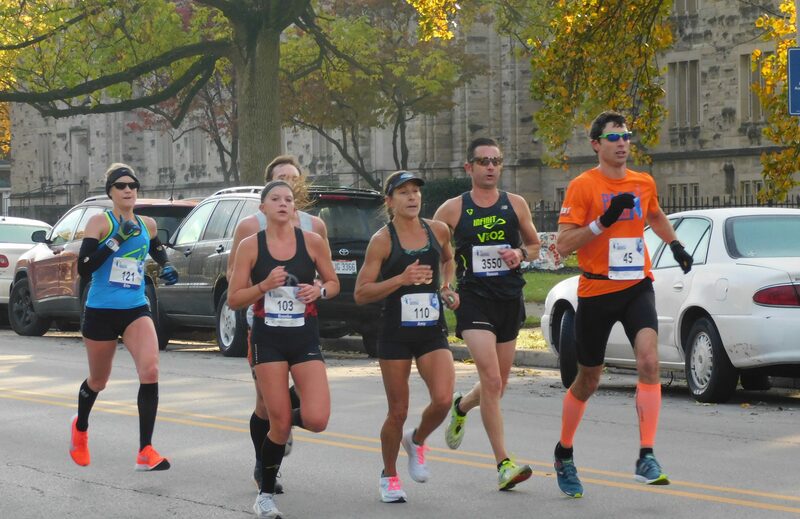 A group of runners travels down Hampton Drive during the Indy Monumental Marathon. Photo by Abby Glaws. NICK TASOLIDES | STAFF REPORTER | ntasolid@butler.edu. This past weekend, the CNO Financial Indianapolis Monumental Marathon took place. The marathon is the 20th largest in the country. The 26.2 mile race qualifies the 8th most runners into the Boston Marathon. The route also passed through Broad Ripple and ran down West Hampton Drive, which cuts through Butler’s campus. The marathon route takes place all throughout Indianapolis and shows off Indy’s most prominent destinations. Some of these destinations included the Indiana State Capitol, Lucas Oil Stadium, Bankers Life Fieldhouse and Monument Circle. A wide variety of Butler students participated in the marathon. One student who participated in the marathon is Frank Duarte, a graduate student majoring in music composition. Duarte is an experienced runner who said he has ran about 5,000 miles from high school to now. “I was training six days a week running an average of about 30 miles per week,” Duarte said. He began training for the marathon late June, and despite being an experienced runner, Duarte said he did encounter some difficulties. Duarte said there had been a mix up and he had been put into a group that was above his pace. Runners are traditionally organized into groups based off their estimated finish time. “Unfortunately, since I was in the wrong group I was forced to go faster than I wanted and started getting shin splints around mile five,” he said. Even with the obstacles, he still finished with a time of 4 hours and 35 minutes, his fastest 26.2 miles ever. Sam Burchett, a first-year secondary education major, ran the half-marathon after training since May. Burchett was satisfied with his time of 1 hour and 26 minutes, but also said he can improve. One final student that ran the marathon was Mollie Flook, a first-year political science major. Flook is an experienced runner and has wanted run a marathon since she was 12. Flook has been training for four months before running.